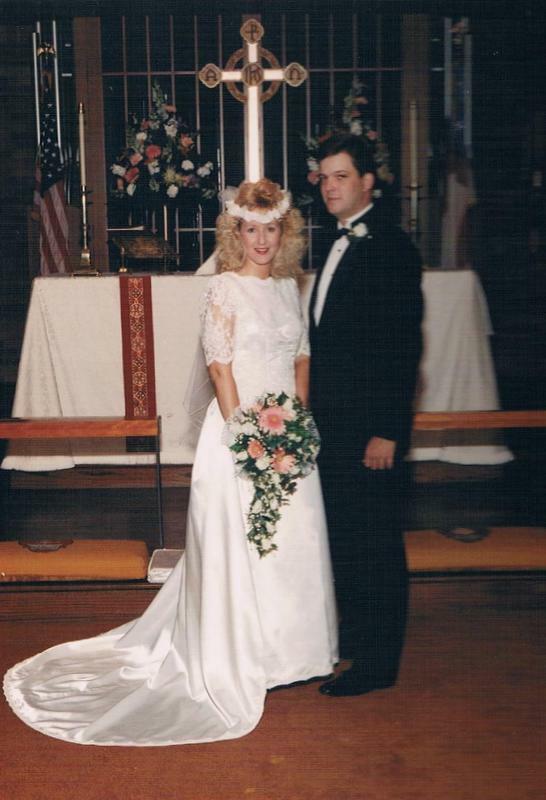 Twenty five years ago today we exchanged vows before God, Family and Friends at Holy Trinity Episcopal Church here in Auburn. That day was magical, filled with a flurry of activities. Unlike most couples we spent the day together. I didn't wanna look back and think that our wedding day was about spending time with other people but more about spending the day together. He of course didn't go to me for the hair and makeup session. He was waiting for me at the church along with the photographer and the other members of the wedding party. Those that know me know I am never late. But Honey was beginning to wonder where I was seeing how I was 30 minutes late. I recall walking into the church and announced that I was ready for pictures, the photographer snapped this shot. It remains one of my fav pics from that day. I'd love to tell that 24 year old girl a few things....mostly to enjoy the figure, the skin and the hair! Honey is exactly what I wanted in a husband and 25 years later I think I love him more now than I ever imagined I could. 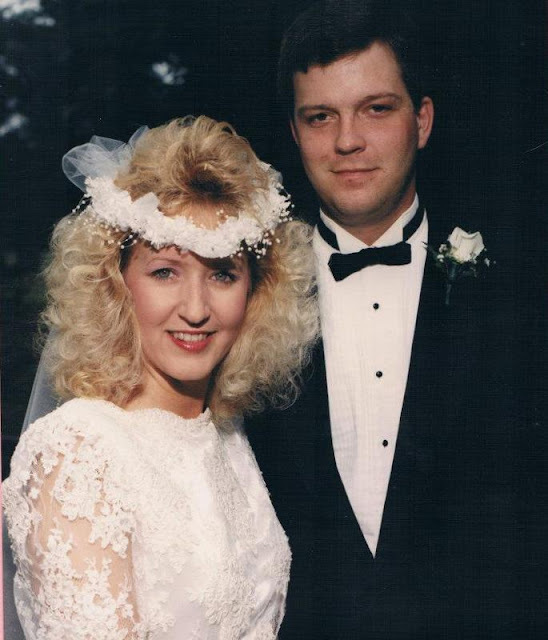 Happy Anniversary, Honey. This has been the most amazing 25 years of my life. I love you with everything I am and everything I have! Happy anniversary. I love the pictures. Happy Anniversary. I love the picture...the shorts, the socks, the shoes. Priceless! I agree about spending time together. We did the photos before and then went down together to wait with our bridesmaids and groomsmen. We had such a good time together before the wedding. Happy Anniversary! May you have many many more! 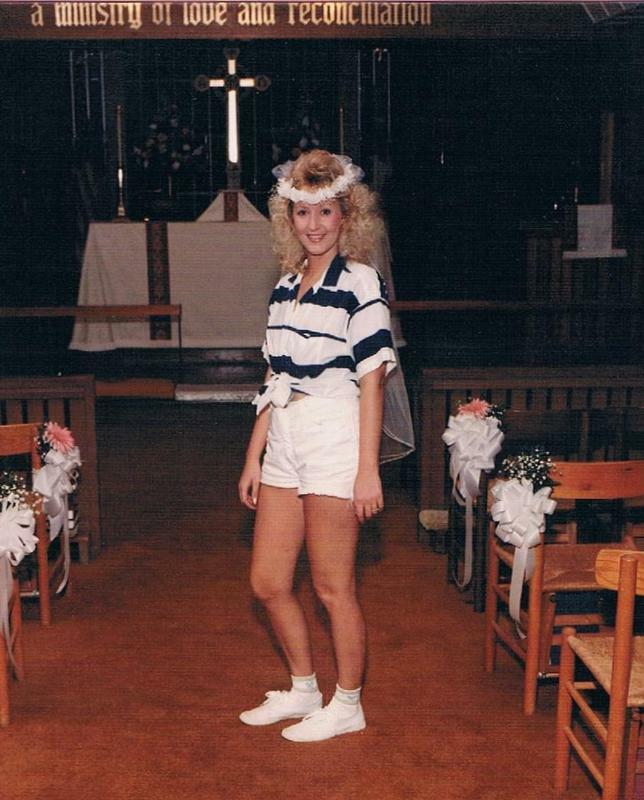 Love the shorts and veil- you rock! Great pictures! You haven't changed at all! Happy Anniversary! 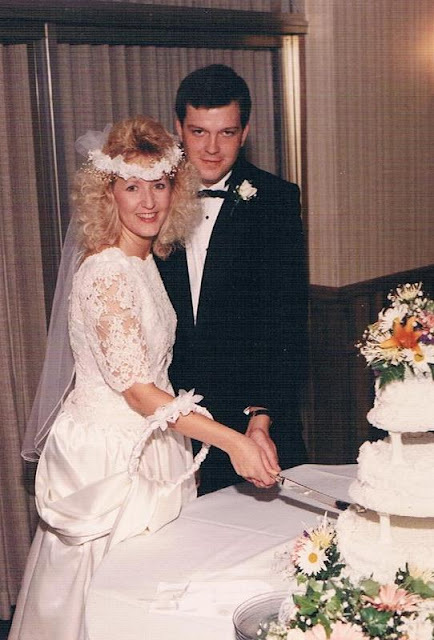 We just celebrated 34 years on Friday. Love the pictures from your special day! Congratulations and a belated happy anniversary. We just celebrated our 40th. Enjoy your time with each other and best wishes for at least another 25 years together.